I like beauty products as much as the next girl, but in the ever illusive quest to simplify I’ve made an effort to use some household and natural products instead of what’s lurking inside my beauty drawer. I’m aiming for health naturally, in the long run. There is so much research out there about how Apple Cider Vinegar (ACV) can be used to cleanse your body internally and externally as an acidic antibacterial source. Make a tea with 1 tablespoon ACV per 1 mug of steaming hot water (add honey if you need to deintensify the taste) and sip up to two times daily. 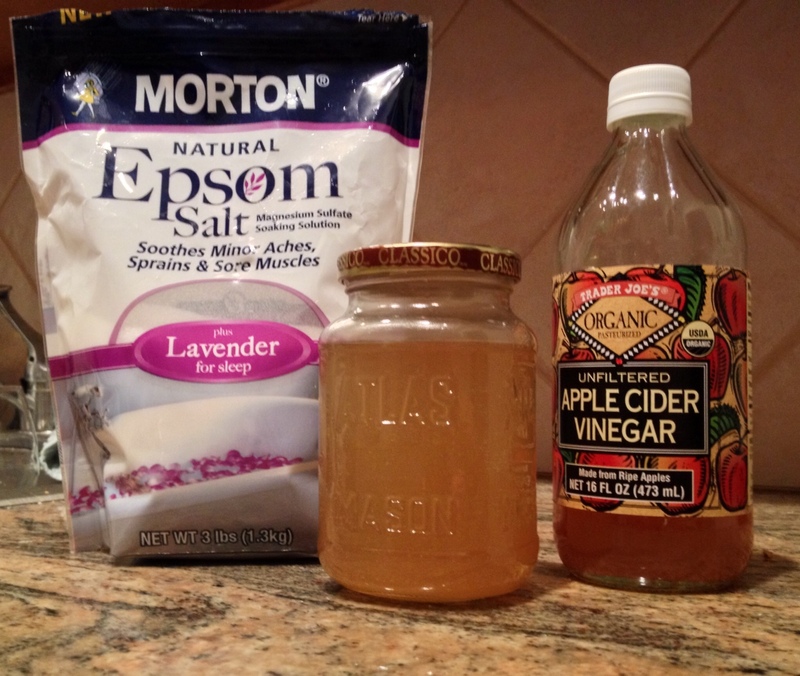 For topical use, take an old glass jar (I used a mason #trendy) and fill it half-and-half with ACV and water. Use this mixture as a toner nightly after you cleanse, and before you moisturize. In an effort to relax, and take time to rejuvenate, bath time has become “a thing.” Epsom salts relax muscles and pull toxins out the body. Plus with lavendar aromatherapy, light a few candles, put on the Norah Jones and saillllll away. Granted, I know this health post isn’t all encompassing, and alternative methods lack scientific backing, but out of curiosity, I’m always game to try. Have any of you had any luck with the above, or any other natural health routines?